Before Vijayanagara: Prehistoric Landscapes and Politics in the Tungabhadra Basin is the first comprehensive survey of the archaeological evidence for Iron Age habitation and culture in the Tungabhadra River valley - a region which witnessed the rise and fall of Vijayanagara during the 14th-16th centuries. By meticulously documenting sites of prehistoric activity over an area of some 80 square kilometres, Andrew Bauer demonstrates that Iron Age societies in this part of peninsular India were not nomadic, as has sometimes been assumed, but were rooted to the land through a variety of productive locations, settlements, and memorials. Among the more than 1,000 features that the volume analyses are megalithic monuments, painted natural rock surfaces, masonry and earthen structures, as well as terraces, retention walls, and reservoirs. According to the author, the creation of material and symbolic landscapes in the Tungabhadra River basin played a crucial role in the development of the social inequalities that he views as characteristic of the prehistoric society and economy at this time. His theory for emergent inequalities, informed by anthropological and geographical approaches to space, contributes to a new evaluation of the Iron Age in southern India. Bauer's interpretation enhances an understanding of the context in which complex states, such as Vijayanagara, emerged in later times. Andrew Bauer's extensive field surveys are documented by topographic maps and satellite data, explanatory diagrams, analytical and statistical tables, and numerous photographs. His volume may be considered a definitive study of Iron Age culture in central Karnataka. Andrew M. Bauer received his Ph.D. in anthropology in 2010 from the University of Chicago. He is currently Assistant Professor of Anthropology at the University of Illinois, Urbana-Champaign. His research interests encompass South Asian archaeology, environmental anthropology, social inequalities, and the politics of spaces, places, and landscape histories. Until the completion of Tungabhadra River Dam and the attendant onset of modern agricultural and industrial development in the middle of the 20th century, the inhabitants of the Vijayanagara imperial capital appear to have the greatest effect on the physical landscape of the region. During the more than 200 years when the city flourished, the land was reshaped for agriculture, for defense, for residence and for display. Yet, when Sangama chiefs founded Vijayanagara in the 14th century, the region had been occupied by humans for thousands of years. Dr Andrew M. Bauer, the author of this, the fourteenth volume in our Vijayanagara Monograph Series, suggests that the first inhabitants of the new capital would have adapted to a landscape not only shaped physically by centuries of increasingly intensive economic activity, but also shaped ideationally through intertwined social, political and religious development. Before Vijayanagara: Prehistoric Landscapes and Politics in the Tungabhadra Basin is of unusual interest since it considerably expands the scope of our previous volumes on the Hampi Vijayanagara site, temporally, spatially, materially, technically and theoretically. Bauer extends his investigation back into pre-historic times, some four and a half millennia before the founding of the Vijayanagara state, building on the recent work of the Vijayanagara Metropolitan Survey and the Late Prehistoric/Early Historic Landscapes of the Tungabhadra Corridor Project, both created by Professors Kathleen D. Morrison and Carla M. Sinopoli and their students. The Tungabhadra River Valley, in which the remains of the Vijayanagara capital are located, contains many sites that can be dated to the Neolithic (3000-1200 BCE) , Iron Age (1200-300 BCE) and the Early Historic (300 BCE-300 CE) periods. Until the advent of the Tungabhadra Corridor Project, archaeological research in this part of the Deccan were concerned with the Neolithic and Vijayanagara periods. In contrast, Bauer's research focuses on the Iron Age. The author meticulously documents sites of prehistoric activity dotted throughout some 80 square kilometres of the region in which the Vijayanagara capital was founded. While Indian and foreign scholars had previously identified some burial sites, megalithic tombs, painted rock surfaces and settlements, Bauer's field research not only records more than 1,000 megalithic features, stone circle sites and isolated tombs, but also greatly deepens the descriptive detail for each locale. Furthermore, he adds to and makes more precise the catalogue of site types by recording occupied rock shelters, rock slopes and terraces, retention walls, modified rock pools and reservoirs, as well as rock art panels and megalithic complexes and settlements. This exhuastive documentation demonstrates that Iron Age societies were not nomadic, as previous students have suggested, but were rooted to the land through numerous settlements and memorial sites. The theoretical focus of Bauer's work is the investigation of the social, political and economic activities and practices in which the emergence of institutionalized social in- equalities are embedded. His analysis of the Iron Age draws both on the literature on complex societies in general, and on the work of Indian and foreign scholars who have traced the evolution of inequality in the subcontinent from the Neolithic through the Early Historic periods. According to Bauer, the "natural" landscape plays a crucial role in the development of inequality, for the author understands it to be an eminently human product. He argues that "many geographical features of the study region ... such as the distribution of soils, sediments, vegetation, and even the morphology of many of the residual hills and landforms in the study region, have been profoundly altered and shaped by prehistoric land-use". To document humanly-produced landscape, he employs a number of innovative techniques involving "geomorphological observations, multi-spectral remote sensing analyses, and [the study of] pollen and phytolith data." For example, Bauer investigates indicators of land use such as irrigation facilities and soil and other geomorphological transformations produced by agriculture. The distribution of indicators of grazing and cultivation are ascertained by studies of land forms and soils using maps, satellite imagery and field documentation. The author concludes that the increasing complex society that developed during the Iron Age was characterized by unequal social access to resources and places: that is, individuals differed in their ability to create and use productive and symbolically significant places and the resources linked to these places. Such differences were institutionalized, and while it is not yet possible to observe the precise social distinctions that developed during this period, they related to the production of resources for herd management, the provisioning of communal feasts, social status and the ability to mobilize labour. His analysis of the relation of different types of sites and of variation of material remains within sites leads the author to propose that groups were defined by the territory they occupied, and within territories, by social statuses that gave greater or lesser access to symbolically significant places within and outside settlements. In summary, Bauer's monograph introduces a much earlier time period to scholars interested in the Vijayanagara period, in which the relations developed between people and between humans and habitat in ways that underlay the subsequent history in the region. By explicating ecologically informed theory for human adaptation, and by developing systematic and innovative techniques for observing indicators of Iron Age culture, society and economy, the author greatly enhances our understanding of the context out of which complex states grew. Research in the Tungabhadra Basin by the Vijayanagara Research Project, Vijayanagara Metropolitan Survey and Late Prehistoric/ Early Historic Landscapes of the Tungabhadra Corridor Project could not have taken place without the gracious permission of the Government of India and the encouragement and support of the Karnataka Department of Archaeology and Museums, Dr R. Gopal, Retired Director. Drs Pradeep Mehindiratta, Retired Director General, and Purnima Mehta, Director General of the American Institute of Indian Studies, have expertly steered our projects through well-mapped passageways. As with previous volumes in our Monograph Series we are indebted to Ramesh Jain and Siddharth Chowdhury of Manohar for conscientiously supervising the production and printing. Donations by a number of friends and colleagues have made it possible for us to bring out this particular volume. To all these individuals and institutions we offer our profound gratitude. As a result of recent expansive and systematic research near Vijayanagara, it is increasingly clear that the Tungabhadra basin was a significant region of settlement and occupation in prehistoric times (e.g. A.M. Bauer 2010a; Johansen 2008; Sinopoli et al. 2009; Morrison et al. 2005, 2009). In fact, during the Iron Age (1,200-300 BCE), no less than 2,500 years prior to the founding of the Vijayanagara capital in the early part of the 14th century CE, the Tungabhadra basin appears to have been one of the more densely occupied areas in South India. It is during this period that scholars can now point to the emergence of institutionalized social inequalities and a variety of monumental constructions and environmental transformations. These include the creation of megalithic burial chambers and cemeteries, the development of expansive socially and symbolically distinctive settlements, intensive pastoral land use, the introduction of irrigated agriculture, and a variety of related environmental transformations that were mediated through the plants, animals, and materials on which people relied. Indeed, it is becoming equally clear that the environmental conditions that dominate the region today, so heavily shaped during the Vijayanagara period, had already been altered through a long history of dynamic human-environment relationships that extend well into earlier periods. These earlier landscape transformations would come to influence land use activities of later times. For example, recent evidence suggests that the expansive plains that extend between the rocky hills punctuating the region, and that were crucial to agricultural intensification during the Vijayanagara period and today, were significantly shaped by dynamic interactions between humans and other environmental constituents (soils, plants, animals, water) during the preceding three millennia. Furthermore, much of the region's native flora had also been modified by the time of Vijayanagara's founding (e.g. A.M. Bauer 2010a; Morrison 1995a, 2009). In short, Vijayanagara inhabitants would come to live and produce an environment that was already remarkably transformed. These pre- Vijayanagara landscape transformations, although not associated with the same kinds of overt imperial strategies of later times, were no less political in their own historical and cultural contexts; as I will demonstrate here, many of them were embedded in cultural practices that created and maintained social differences and inequalities. In other words, links between social relationships of inequality and landscape production-the creation and alteration of physically and symbolically differentiated spaces and places-have a history in the Tungabhadra basin that significantly predates the Vijayanagara Empire, beginning most prominently during the South Indian Iron Age. In this volume I present recent archaeological and environmental research on the relationships between the emergence of social inequalities and the historical production of landscapes in an 80 sq. km. study area in the vicinity of Vijayanagara, but here I focus on the prehistoric periods before Vijayanagara. I begin Chapter One, which is in the nature of an introduction, by defining my terms, outlining my methods, and reviewing previous research on the prehistory of South India that make this work possible. Here I briefly discuss what I mean by "landscapes" within the context of different archaeological approaches' to space, which have tended to dichotomize "ecological" and "interpretive" frameworks. I will use landscape to reference both material and symbolic dimensions of spatial practices. Landscapes refer to the cultural meanings that were attributed to places and spaces as they were historically experienced, perceived, imagined, and reproduced (e.g. Harvey 1990; Smith 2003). The processes of landscape production are thus embedded in how peoples' daily activities and tasks constantly recreate the material and symbolic environments of which they are a part (e.g. Ingold 2000). This framing is useful to evaluate the emergence of social inequalities in prehistoric South India because previous research suggests that changing strategies of land use were a critical dimension to the historical development of institutionalized social inequalities during the 1st millennium BCE. I proceed to review excavations from several sites in the Southern Deccan that have shown changes in production and land use practices through a diversification of cultigens toward the end of the preceding Neolithic period (3,000-1,200 BCE) and the beginning of the Iron Age. Moreover, faunal analyses from Iron Age deposits also suggest variability in the consumption and use of wild and domesticated animals, including the incorporation of cattle into communal feasting practices and commensal politics during the period. Thus, I argue that the emergence of social inequalities in prehistoric South India can be fruitfully addressed through a combination of archaeological and environmental research designed to investigate the relationships between social distinctions and the reformulation of the material and symbolic environments that peopled produced during the 1st millennium BCE. 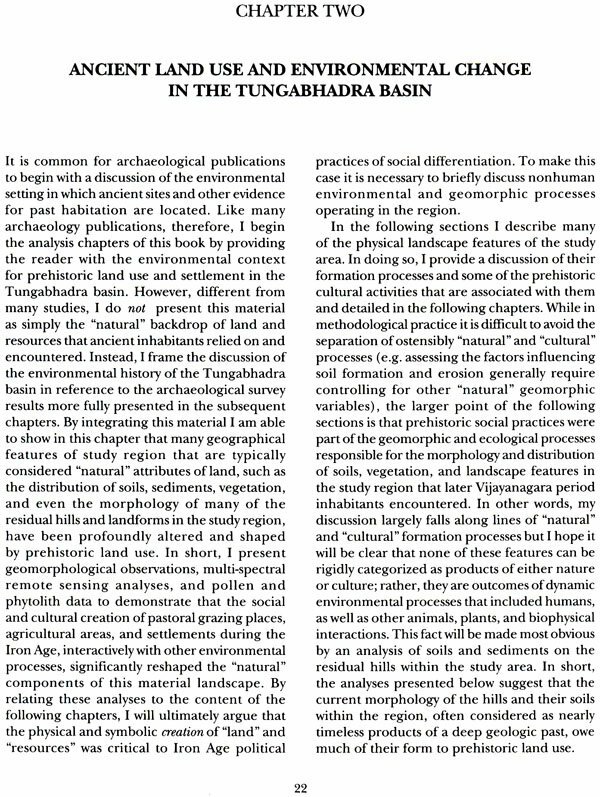 I begin these investigations in Chapter Two by focusing on the environmental context of prehistoric habitation in the Tungabhadra basin near Vijayanagara. However, rather than present this material as simply the geographical setting or the "natural" backdrop of land and resources, I frame the discussion in light of the results of archaeological survey presented in the subsequent chapters. I do this to highlight the point that the distribution of soils, sediments, vegetation, and even the morphology of many of the hills in the study region have been profoundly altered and shaped by prehistoric land use and the other materials and environmental constituents (e.g. cattle) on which people relied. Here I argue that by anticipating and facilitating the actions of non-human environmental components, such as water, vegetation, and soil, ancient in- habitants produced a politicized landscape of resources that did not exist a-priori. It was created by converting locales into particular places where activities converged-places where water accumulated, soil was retained, herbs and grasses grew, and cattle grazed. In the process, the environmental history of this region was greatly transformed. In this chapter, I present geomorphological observations, multi-spectral remote sensing analyses, and pollen and phytolith data to demonstrate that the creation of settlements and pastoral grazing places during the Iron Age significantly reshaped the "natural" components of this material landscape. 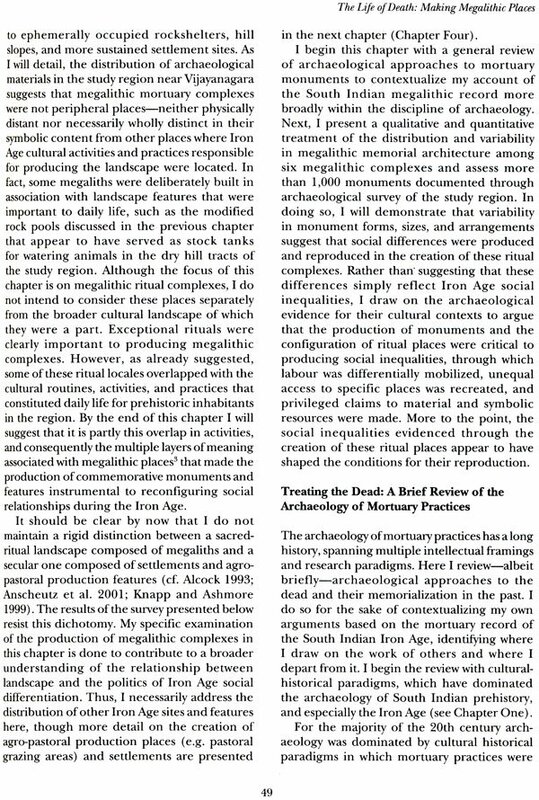 By relating these analyses to the content of the following chapters, I argue that the physical and symbolic production of "land" and "resources" was critical to Iron Age political practices of social differentiation, which appear most salient at megalithic mortuary places. The unequal construction of megalithic monuments is a traditional form of archaeological evidence for the development of social differentiation during the Iron Age, as well as the most ostensible indicator for new forms of large-scale labour mobilization. 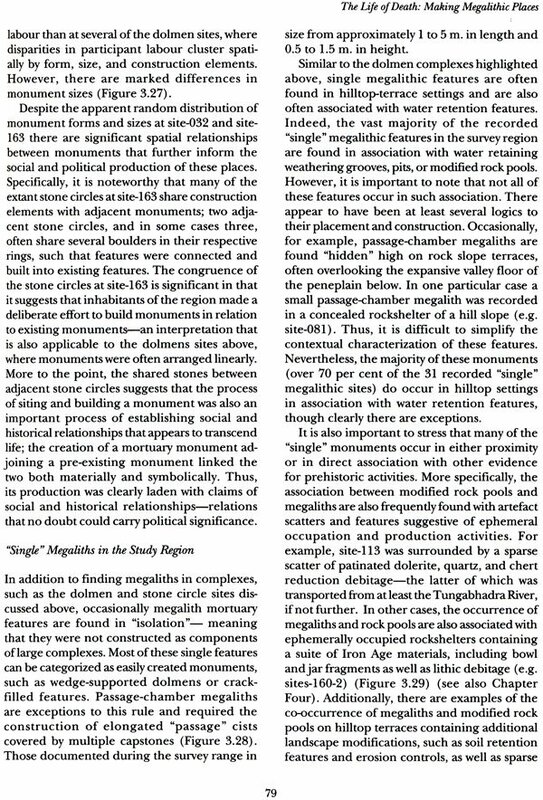 In Chapter Three, I present data on the production of Iron Age megalithic ritual complexes in the study region. More specifically, I provide an analysis of memorial architecture among six megalithic complexes and assess more than 1 ,000 monuments. I detail how these monumental complexes were created and arranged while also illustrating that the production and modification of other environmental features was integral to the creation of privileged-access ritual places during the Iron Age. In this chapter, I stress that archaeological survey results indicate that megalithic complexes are places in a landscape densely populated with other Iron Age places, and that megalithic sites frequently overlap with other land-use sites. I argue that these data suggest that megalithic mortuary complexes were not isolated cemeteries or peripheral places, neither distant physically nor necessarily wholly distinct in their symbolic content. To the contrary, some megaliths were deliberately built in association with landscape features that were important to the routines of daily life, such as modified rock pools that appear to have served as stock tanks for watering animals in the dry hill tracts of the study region. At the same time, I will demonstrate through analyses of monument sizes and distributions that not all ancient inhabitants had equal abilities to mobilize the necessary labour to produce these monuments and places. By the end of this chapter, I suggest that it is partly the overlap in activities and the generation of differentiated meaning that made the unequal production of these places instrumental to reconfiguring social relationships during the period. 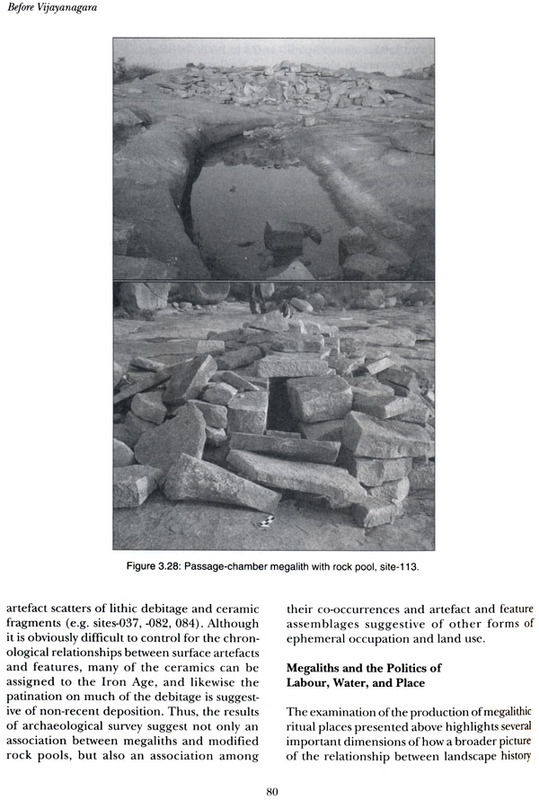 The construction of megaliths in concert with seemingly mundane landscape features, such as water-retaining rock pools and soil retention walls, connected commemorative activities with other forms of ancient land use and implies that everyday activities (e.g. herding) had cultural significance beyond simply supplying subsistence. In Chapter Four, I analyse the distribution of surface remains in the study area to examine the creation of places of land-use and settlement activities in greater detail. My assessment of chronological and spatial shifts in their locations throughout the Neolithic (3,000-1,200 BCE), Iron Age (1,200-300 BCE), and Early Historic (300 BCE-500 CE) periods indicates both continuities and changes in land use and the making of settlements as social distinctions were reformulated and institutionalized during the 1st millennium BCE. I conclude, for example, that continuities in some form of dispersed herding activities throughout the Neolithic and Iron Age periods involved the creation of places for the production of resources that were important to the negotiation of social relationships through feasting activities, clearly linking the socio-politics of the period with the environmental history. At the same time, however, a growth in the number, sizes, and spatial divisions within places of concentrated and sustained settlement during the Iron Age appears to have reaffirmed emergent social distinctions, producing a material and symbolic environment through which social differences and inequalities were increasingly inscribed spatially in residential areas. 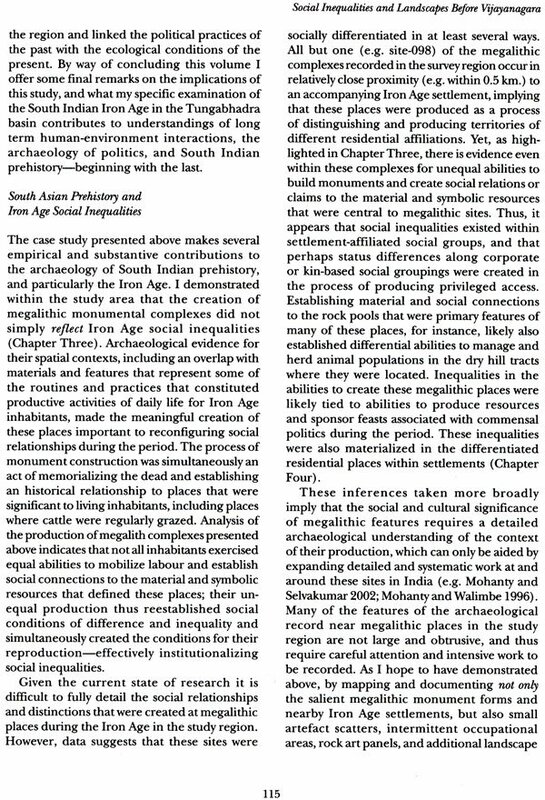 In my conclusion, Chapter Five, I summarize the theses and evidence of the previous analyses and argue that the production of unequal access to material and symbolic resources created differential abilities to reconstitute meaningful places and mobilize labour during the South Indian Iron Age. This effectively reauthorized privileged access and institutionalized social inequalities. The cultural practices responsible for creating the Iron Age landscapes of northern Karnataka (e.g. through building megalithic ritual complexes, creating differential pastoral production lands, and establishing irrigated agriculture) concurrently recreated the contexts for the practice of politics during the period and shaped the environmental history of the region. In short, social and political differences were negotiated in and through the production of a new symbolic and material field. I close the volume by stressing that the landscapes of the South Indian Iron Age were not simply products of ancient cultural activities and symbolic forms, but also products of other dynamic environmental constituents (e.g. soils, stones, and animals) that contributed to the historical uses, maintenance, and social histories of the places they comprised. The material forms that created Iron Age landscapes had meanings to inhabitants, meanings that constituted specific social relations to places. The materiality of these places, however, did not simply constitute symbolic "claims," but were physical instantiations that required material interventions and use to be made and challenged. For example, differential grazing and residential places were created through the construction of retention features and delineation walls. They were not simply claimed; they were built and used. However, this was not a singular activity. Erosion processes, such as sheetflow, animal compaction, and mass wasting, contributed to their material histories and forms, forms that were refashioned by people interactively with dynamic properties of soils, stones, and plants. These activities had a significant role in shaping prehistoric social inequalities and the environmental history of the region, linking the political practices of the past with the ecological conditions of the present-conditions that the later Vijayanagara Empire would also come to inhabit and continue to alter. This volume examines relationships between social inequalities and landscape history in ancient South India. The study is set in a portion of the Tungabhadra River basin near the capital of South India's expansive historical empire, Vijayanagara. Yet, rather than focus on the now well-studied monumental remains of the medieval period city, this work examines the prehistoric periods of settlement and occupation in the region before Vijayanagara. What I hope to make clear in the following pages is that prehistoric landscape transformations, although less salient and less overtly recognizable than those of the latter periods, were no less tied to the political creation and maintenance of social differences and inequalities in their own historical and cultural contexts. As I will demonstrate in subsequent chapters, links between social relationships of inequality and landscape production-the creation and alteration of physically and symbolically differentiated spaces and places-have a history in the Tungabhadra basin that significantly predates the Vijayanagara Empire, beginning most prominently during the South Indian Iron Age (1,200-300 BCE). In this chapter I lay the groundwork for this study by defining my terms and analytics, outlining my methods, and reviewing previous research on the prehistory of South India that make this work possible-starting with the latter. The South Indian Iron Age has been the subject of scholarly research for nearly two centuries. Until recently, however, most research on the period has focused solely on a complex of mortuary remains and associated monumental, megalithic architecture, which appears to have been constructed across much of the subcontinent during the 1st millennium BCE (Figure 1.1) . Limited analyses of burial remains, mortuary architecture and grave goods has produced a picture with which archaeologists have long suggested that inequalities in status and social differences developed during the period, yet ironically a picture that does not address how Iron Age inhabitants lived and reproduced social relationships. In short, previous scholarship has focused attention on recognizing and categorizing forms of social difference and political relationships through the period's mortuary record (e.g. Brubaker 2001, Moorti 1994), but not on the activities and social practices that gave substance to these forms and actively comprised social organization. This picture continues to change as recent research increasingly targets Iron Age settlements in an effort to understand the social, political, and economic activities and practices of their ancient inhabitants. Indeed, it now appears that both hierarchical and horizontal social distinctions were formalized during the 1st millennium BCE at least partly in connection with changes in social strategies of production and consumption. 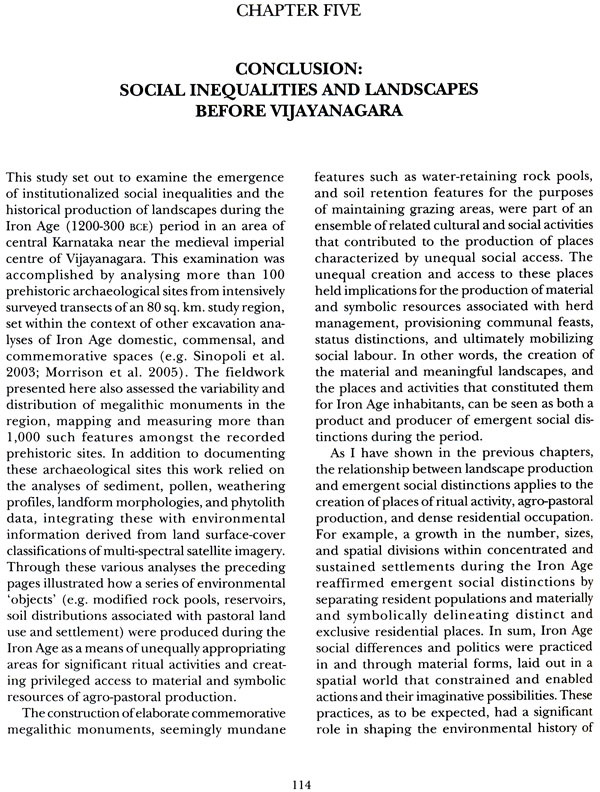 Before proceeding to an analysis of the archaeological remains of the Iron Age period in the vicinity of Vijayanagara I will review previous research on the Iron Age of India's Southern Deccan region more generally in order to contextualize the arguments of the research presented in the subsequent chapters. In so doing, it is important to recognize that the South Indian Iron Age is an archaeological period situated between that of the Neolithic (3,000-1,200 BCE) and the Early Historic (300 BCE- 300 CE) periods; archaeological materials from all three of these periods were recorded in the research presented in this volume and bear on its conclusions. Thus, I begin the review with the Neolithic period. The archaeological foundations of the eolithic period in the Southern Deccan region of India can be attributed to the late 19th century geologist Robert Bruce Foote, a member of the Geological Survey of India, who is known his early descriptions of the geological features of the Southern Deccan and for his concurrent documentation and ordering of PalaeolithicNeolithic, and Iron Age artefacts (e.g. Foote 1916). Since the work of Foote, however, the Neolithic period has become redefined as Mortimer Wheeler's (1948, 1949) "Stone Axe Culture", which he based on the presence of dolerite grounds tone axes and a coarse, grey, hand-made ceramic industry through his excavations at Brahmagiri. Beginning with the work of Foote, more than a century of research on the South Indian Neolithic has produced a general characterization of social life during the period. Subsistence activities in the Southern Deccan region during the Neolithic appear to have centred on a mixed agro-pastoral regime, emphasizing the raising of cattle and a series of dry farmed cultigens augmented with the hunting of a variety of wild animal species (e.g. Fuller 2003; Korisettar et al. 2001; Paddayya 2001; P.K. Thomas 1984). The early crop package of the Neolithic period included two millets native to South India (Brachiaria ramose and Setaria verticillata) and two pulses (Macroty- loma uniflorum and Vigna radiata), which were probably cultivated during the summer monsoon rains (Fuller 2003; Fuller et al. 2001). Fuller et al. (2001) have also suggested that early forms of small-scale reservoir irrigation might have begun in the later part of the Neolithic period because both wheat (Triticum sp.) and barley (Hordeum sp. 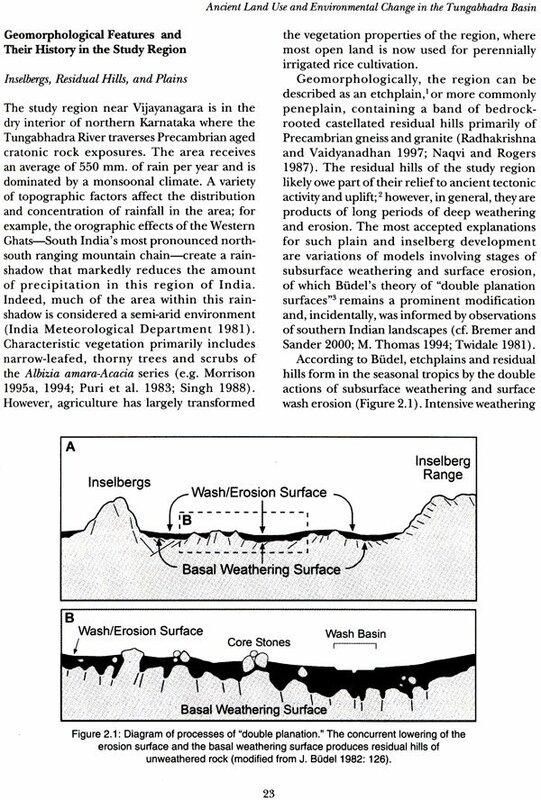 )-which presumably require winter rains that are conspicuously lacking in central and eastern Karnataka-were introduced into the Southern Deccan region from northern India around the beginning of the 2nd millennium BCE (see also Kajale 1984). Small village settlements were set in locations both near major rivers, such as the sites of Veerapuram on the Krishna River and Hallur and Kadebakele along the Tungabhadra River, but also in locations away from major rivers in areas that were likely conducive to dry farming and animal grazing (cf. Johansen 2004; Sinopoli et al. 2009; Chapter Four). Many sites in the region, though not all, contain large ash- mound features constructed of accumulations of burned and vitrified cattle dung in quantities sometimes great enough to produce piles tens of meters in height. These features were formed by the repeated accumulation and burning of 'an evidently valued, sacralised substance collected from an animal with well-documented economic and symbolic importance to Neolithic society' (A.M. Bauer et al. 2007: 11). The distribution and the presence or absence of both large and small ashmounds at Neolithic settlements has been the source of considerable debate about the role and function of these features to Neolithic lifeways (Johansen 2004). For example, Korisettar et al. (2001) have suggested that a functional distinction should be made between Neolithic settlements and Neolithic ashmound sites, in which the latter most likely represent seasonal settlements for populations dispersed from other residential sites. In contrast, others have highlighted the correspondence of ashmound features and domestic refuse to argue that the features were generally created at substantial Neolithic period residential sites. In these cases, the creation of ashmounds, at least in their early stages of development, appear to have been associated with the activities of cattle keeping and stock enclosure maintenance at settlements (cf. Allchin 1963; Johansen 2004; Paddayya 1991, 1998, 2001).Johansen (2004) has convincingly argued that at some point during the Neolithic period these maintenance activities became connected to socio-symbolic ritual practices and that many ashmounds would subsequently take on monumental significance (see also A.M. Bauer et al. 2007). Excavations of Neolithic period settlements or burials have yielded little evidence of pronounced social inequalities during the period. 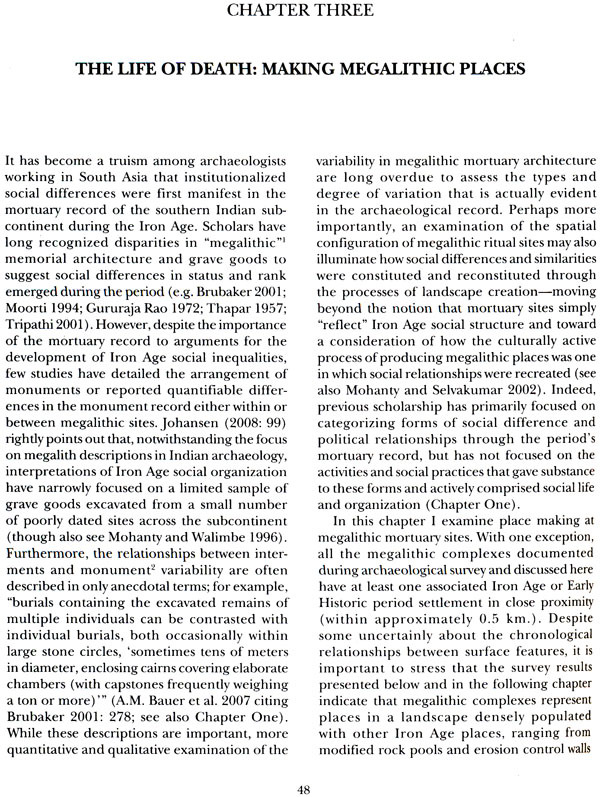 For example, in the relatively few examples of excavated burials, mortuary differences appear to reflect only distinctions between children and adults, implying that social relationships were not characterized by salient inequalities marked through burial rituals.' Moreover, the construction of ashmounds within Neolithic settlements lacking differences between domestic structures and burial treatments (e.g. Paddayya 1993, 1998, 2001) suggest that the production of these features was associated with community and corporate practices (Johansen 2004; Sinopoli et al. 2009; see also A.M. Bauer et al. 2007). However, by the late 2nd millennium BCE the evidence for pronounced social distinctions in prehistoric South India begins to change, and this change corresponds with changes in the production of monuments, mortuary practices, regional settlement patterns, and land use.